Keeanga-Yamahtta Taylor's introduction to Devin Allen's A Beautiful Ghetto. 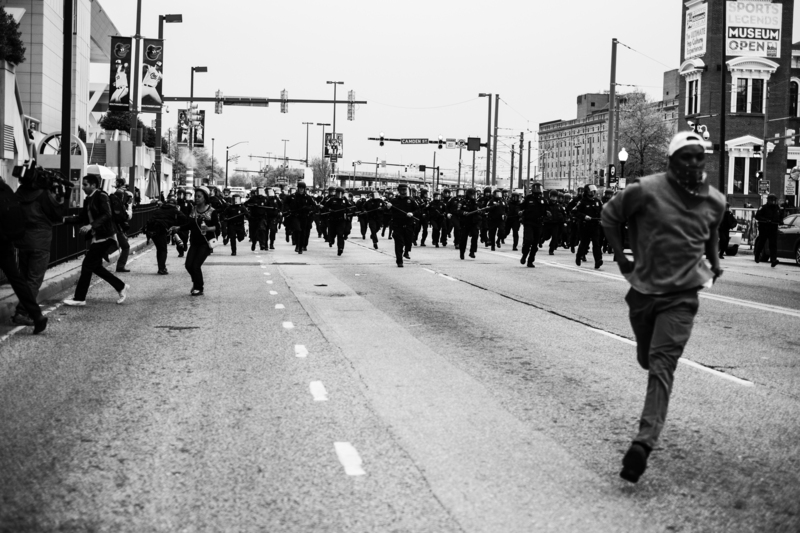 In the spring of 2015, an urban uprising in the city of Baltimore ruptured an uneasy quiet across the country that many mistook for calm. It had been eight months since a rebellion in Ferguson, Missouri, had brought international attention to the scourge of political abuse and violence in the lives of African Americans. In the news media and among the political establishment, there was talk about the peculiarity of Ferguson. It was the suburb that time had forgotten, with its white municipal authorities lording their power and authority over its largely Black population. Ferguson was portrayed as a throwback to the bad old days of Jim Crow racism and political corruption. Ferguson inspired a national movement as once again, a young Black victim of police and judicial misconduct was portrayed as an aggressor and perpetrator and responsible for his own death. But by the early spring of 2015, it was unclear where the new Black Lives Matter movement was going. Endless meetings with public officials only seemed to produce more meetings with other officials, and all the while Black people and many others continued to be killed and abused in the streets of the country. One of those victims was Freddie Gray. Freddie Gray was a young, twenty-five-year-old Black man from West Baltimore. The police arrested him for running away from them. As punishment, Gray was placed in the back of a police van with no seat belt to restrain his body, leaving him to careen violently against the walls of the van as it was driven around West Baltimore. By the time Freddie Gray exited the van, his spinal cord had been 80 percent severed. He slipped into a coma, never to wake again; one week later he died from his injuries. Ordinarily, Freddie Gray would have become another unknown victim of the racism, inequality, and brutality that animates so much of American society. Instead, his death ignited an uprising that pierced the illusion that something was happening to address the epidemic of police violence and abuse across the nation. By the spring of 2015, marches and protests against police brutality were giving way to roundtables at the White House, slow-paced investigations, and costly commissions. Gray’s death was a terse reminder that the pace of police killings continued unabated. Ferguson had been treated as an exception, but Baltimore exposed systemic—as opposed to superficial or exceptional—injustice and inequality. Here was a city barely forty miles from our nation’s capital, where the nation’s first Black president sat as the most powerful figure in the world. Where Ferguson’s Black population endured the predatory harassment of police and elected officials, Black people were in power in Baltimore. From the mayor to the chief of police, African Americans held powerful positions across city government in Baltimore. Indeed, three of the six police officers indicted for the murder of Freddie Gray were African American. But Baltimore came to sharply symbolize how the financial and political success of some African Americans could not be assumed for all African Americans. Despite the ascension of some “Black faces in high places,” tens of thousands of Black people in Baltimore lived a life of hardship. The bitterness and anger at that hardship boiled over with the murder of Freddie Gray. When protests escalated into an uprising, public officials, including president Barack Obama and mayor Stephanie Rawlings-Blake, described the young people at the heart of the rebellion as “thugs.” Media obsessions with buildings burned and looted, cars set ablaze, and millions of dollars of property damage resulted in presumptuous condemnations of “senseless” or “mindless” violence exemplified by the awful question, “Why are they burning down their own community?” The Baltimore Uprising was not, however, “senseless.” It was the boisterous demand of the Baltimorean Black working class and poor to be heard and seen after decades of being rendered invisible. As author Arundhati Roy has written, “There’s really no such thing as the ‘voiceless.’ There are only the deliberately silenced, or the preferably unheard.” Rebellions are always surprising in American society because segregation hides Black life from white America. Just as urban uprisings in the 1960s brought the awful racism and injustice faced by Black America to the surface of American society, Ferguson and Baltimore had the same effect. But in the rush to understand or report on “how could this happen,” the media and political establishment flatten and deaden the vibrancy and complexity of Black life. This was certainly the case in Baltimore. Black Baltimore, with its long history, has instead been suffocated by mind-numbing statistics cataloguing poverty, lead poisoning, homicides, and unemployment. These, of course, can be important markers in attempts to chart the public and private institutional underpinnings of the social crises in communities across Baltimore, but they are often highlighted at the expense of locating the humor, beauty, history, community, and humanness of Black Baltimore. In this sense, Devin Allen is a gift. Keeanga-Yamahtta Taylor is a professor of African American studies at Princeton University and the author of From #BlackLivesMatter to Black Liberation.